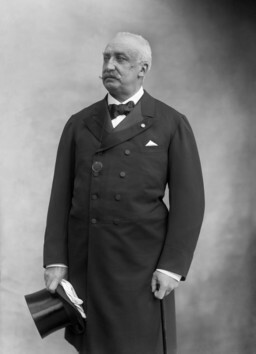 Born in Paris on 30 January 1841, Felix Faure was President of France during the period when review of the Dreyfus case was denied. A leather merchant in Le Havre, he married in 1865, and held the post of deputy mayor from 1870 to 1873. Dismissed by the Ordre Moral government, he was elected to the Chamber of Deputies as a moderate Republican in 1881, and was reelected four times. He was Under-Secretary for Trade and the Colonies in the Gambetta government between November 1881 and January 1882, and Marine Minister in both the Ferry government (September 1883-March 1885) and the Tirard government (January-February 1888). Starting on 30 May 1894, he served as Marine Minister in the Dupuy government; following the resignation of Casimir-Perier, he was elected President of the Republic. He wanted to remain neutral in the Dreyfus Affair, while refusing to call into question the 1894 conviction. He refused to allow president Scheurer-Kestner confide in him, stating "Félix Faure can only hear what the President of the Republic can hear (…) my neutrality is the neutrality of the law." After Esterhazy's acquittal and on the eve of Zola's conviction, he wrote in his journal on 22 February 1898: "To judge this affair, one has to have the file in front of one, to question the accused, hear his responses, listen to the witnesses, the defense and the prosecution. Anyone who pretends to judge otherwise is doing something that is bad and stupid, and even criminal, since it could have serious consequences both inside and outside. The judges have ruled using these elements. No one has the right without clear proof to doubt their judgment." Déroulède became famous after the publication in 1872 of a collection of patriotic poems, Chants du soldat. He founded the Ligue des Patriotes in 1882, and was elected deputy in 1889. He was a Boulangist who later denounced the parliamentary Panama chéquards, and who attempted to march on the Elysée presidential palace in 1899. For this he was acquitted by a jury in the Court of Assizes, but was sentenced to ten years' banishment by the High Court. He returned from Spain following the general amnesty of 1905. 's abortive coup d'état.